R Mukundan, Managing Director, Tata Chemicals Limited (TCL) and Sabaleel Nandy, Head, Water Purifier Business, TCL were at the ISB recently to talk about Tata Swach, an innovative low-cost water purifier. 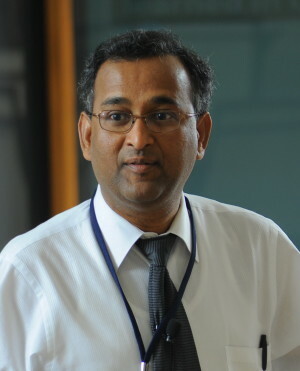 Associate Professor and Head, Centre for Leadership, Innovation and Change (CLIC), Charles Dhanaraj spoke with them. Water is the essence of life, yet 75% of the rural population in India does not have access to safe drinking water. Each year, around 500,000 children in India succumb to diarrhoea before they turn five. In an attempt to provide affordable access to safe drinking water for all Indians, Tata companies have collaborated and developed Swach, a water purifier based on low-cost natural ingredients and sophisticated nanotechnology, capable of delivering drinking water at purity levels matching international standards. Swach began its journey as Sujal, Rice Husk Ash (RHA) that could filter about 85% bacteria, but fell short of WHO standards. The project was revived when Ratan Tata, impressed by the simplicity of the filter, took personal interest and encouraged the team to develop a low-cost water purifier that would also meet international standards of purity. If you look at communication technology, there has been a phenomenal cost reduction. A cross-functional team drawn from Tata Research Development and Design Centre (TRDDC), Titan Industries (Titan) and Tata Chemicals Ltd. (TCL), headed by Sabaleel Nandy, was set up in September 2006 for developing a suitable design and manufacturing technology. Dr Murali Sastry, TCL’s chief scientific officer and one of India’s top nanoscientists decided that nanocoating the RHA with silver will increase its effectiveness against bacteria. This the team developed into an easily manufacturable bulb-like cartridge, which could be attached to any storage vessel (rather than to running water) to produce water of international standards. The cartridge was fitted onto an aesthetic container to meet the aspirational needs of rural India. Finally, Swach was launched in Karnataka, Maharashtra and West Bengal. Tata Swach is innovative in its use of a waste byproduct, RHA, to solve the pervasive problem of impure water. It is also a product of an innovative and collaborative process between many companies. Charles Dhanaraj: Tata Swach is a nice example of good strategy that takes cognition of social issues. The Tatas are seen as a socially responsible company and it sort of blends in naturally within the company. I am trying to understand what is it that drives the approach within the Tatas and how does it affect the bottom line? R Mukundan: We have always gone by what our founder has said, “What comes from the society must go back to the society many times over.” This is actually quite energising for employees. This approach of giving back to society has sustained, because the leadership has continued to build the same business approach within the group. While this has cost us, it is critical to examine if it was worth the effort. We know what each of the companies costs us. We know in Tata Chemicals what it costs to run a Mithapur township and all the other social establishments like the school and hospital which also serve the local community. I think the whole issue is about doing what is good for the society. You need happy employees, happy customers, happy stakeholders and at the same time you also need happy shareholders. All these enable the enterprise to run on a sustained basis. And I seriously don’t think it has affected our bottom line. If you look at sustainable bottom line over a long period of time – I think it has helped us to sustain the bottom line. Charles Dhanaraj: On the aspect of connecting technology and affordability, to some extent you might say you stumbled into it but having learnt this, can this be systematized? We need affordable high tech or high performance devices. R Mukundan: We have tended to look at the cause and effect relationship rather than just affordability. For example, one of our key chemicals is used in melting sand into glass. We wanted to reduce the energy consumed in the entire process by looking at an innovation that can help our consumers. The key issue is when you provide that solution you should not increase the price. On whether this can be systemized – we have a system of stage and gate which we use every time we look at an innovation so there are various stages and they have to pass certain gates, we certainly have market size and the market depth as one of the gates. But that gate works for consumer product businesses much better. Because when you look at market depth and size, affordability becomes an issue. If it is an industrial product it has to be defined in terms of cause and effect. Sabaleel Nandy: In terms of future replication – breakthrough almost always happens whenever a fertile bunch of scientists work closely with the business development team. I think we had an excellent team of highly dedicated and prolific scientists – both the R&D teams from TCS as well as that from Tata Chemicals under Dr Murali Sastry. In addition, we were fortunate to forge a great partnership between these scientists and the business team. On the contrary, there are many instances of innovation teams worldwide, where the gap between R&D and business is not well bridged and crucial aspects such as cost considerations and market realities are ignored. R Mukundan: One of the things I do believe is that technology does increase affordability fundamentally. If you look at communication technology, there has been a phenomenal cost reduction. What has tended not to happen is in older technologies, in which innovation happened in 1800s, they have stagnated, in the absence of fresh thinking. Some of the newer sciences like nano and biotechnology are beginning to impact those spaces to create even better affordability. But I think, we need to ask: Can we make concrete 1/10th of its cost? If we think along these lines, then I think the paradigm will shift. The second issue relates to sustainability. Technology has to be more sustainable. The world is not going to have enough resources to feed 9 or 10 billion people. So, we have to make things which are recyclable. Buildings have to be recyclable. If you write with a pen, that has to be recyclable. I think re-use and recyclability will become very, very critical in future. The world will shift to technologies which deliver affordability in addition to sustainability. Charles Dhanaraj: I want to shift to the theme of leading innovation. It is great to talk about innovation that is required, but how do you create the environment for innovation in your company? Could you point one or two things that you do within TCL? R Mukundan: You need to get out of the way, leave the space. Because I think the biggest problem with innovation is to say you can mandate innovation. I think innovation is a very collaborative process. We can’t go to a bunch of market developers, business developers and R&D guys and point a gun and produce a result. One can do that with a machine but not with innovation. But, how do you enable the team? I think that is the question one needs to ask rather than how you get them to deliver. So creating that enabling environment and creating the space for collaborations to happen is a critical thing. The role of the leadership, right from the chairman, in Tata Chemicals during the Swach journey has been to participate in a process contributing ideas and at the same time trying to help the team get to their goal. And the team feels the pressure. I think the biggest problem with innovation is to say you can mandate innovation. I think innovation is a very collaborative process. So creating that enabling environment and the space for collaborations to happen is critical. Charles Dhanaraj: Suppose I take your job going back three years, what would your advice be? In retrospect, you have learned so much. What are the do’s and don’ts in order to be successful? Sabaleel Nandy: Firstly, don’t take yourself too seriously. We have learnt that the hard way. Youngsters in B-schools end up feeling that they know it all. But the humility to accept that there is definite wisdom of experience lying in the larger organisation is crucial. And it is always useful to take that contrarian advice. Sit back and sleep over the viewpoint for a day and then think about the whole issue again. The second advice is to be very careful in choosing the team. I think the team composition is very, very important. People who are hungry for success are automatic choices. It is also crucial to choose people with relevant experience who are willing to learn and go that extra mile. In fact, if one were to choose between experience and hunger I think one would choose hunger and passion over experience. Finally, I think one needs to be brave and not give up on optimism. There can be many failures but the leader’s optimism can infect the team and this collective optimism keeps the team going. Charles Dhanaraj: Do you want to leave us with any slogan? Swach could have remained a distant idea, but it has been transformed into reality. How did you make it happen? Sabaleel Nandy: If you talk about slogan, I think the last thing that we should have as a team is complacency, which can easily creep in if the team is not cautious. If we don’t have complacency, we should be able to have a fair shot at some reasonably good numbers. Charles Dhanaraj: Do you have any final words? R Mukundan: I agree with him. My fundamental fear is that something out there could completely take us by surprise and we don’t know that. So I keep saying never leave the room thinking that you have got the answers. There is something out there that we don’t know. Charles Dhanaraj: Your group will probably be happy. Only the paranoid survive. R Mukundan: I didn’t want to go there, but I think we need to because every day there is a possibility that something new (like Swach) is on its way which may create the surprise. The world will shift to technologies which deliver affordability in addition to sustainability.